True or False Pope: PAUL KRAMER, A FATHER OF LIES? PAUL KRAMER, A FATHER OF LIES? Fr. Kramer continues to spread his lies, via the world wide web, in his mad attempt to discredit TOFP and its authors. And he has done so even after someone close to him privately asked us for a cease fire, assuring us that Kramer would no longer be posting his online rants (which reveal more about Kramer's mental state than anything else). Since this individual was trustworthy, we agreed to the cease fire and held up our end of the bargain. Unfortunately, the day after the agreement was reached, Fr. 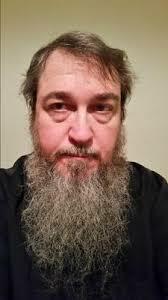 Kramer posted another attack on his Facebook page, sent an email to an extensive distribution list containing his slander, and even bombarded us with a half dozen emails, accusing us of crimes against him and the Church! All in a single day, following the supposed agreement for a cease fire! Even after Kramer breached the agreement (now two weeks ago), we still maintained our end by not responding to his continuous stream of lies, misrepresentations, and accusations of “heresy” for allegedly holding positions that we explicitly refute in our book. Since Kramer has, unfortunately, proven that he lacks the self-control necessary to stop spreading lies and misinformation, we will respond to his false accusations for the sake of the truth. Another point is that because Kramer has been a public critic of Sedevacantism for many years, the devil evidently imagined that he could use Kramer’s recent conversion to the errors of Sedevacantism (which he uses to justify his rejection of Francis) to deceived an entirely new group of Catholics. The devil accomplishes this by a self-proclaimed opponent of Sedevacantism, yet who spreads the very errors that lead to the Sedevacantist conclusion. For example, we see Kramer spreading the error which maintains that it is up to each individual Catholic in the pew to decide for himself if the man elected, and recognized as Pope by the Church, is guilty of the sin of heresy. If they conclude that he is, then they must also conclude that he is not the Pope. This error leads quickly to the next, namely, that they are permitted to formally separate from him, and publicly declare him to be an antipope. Suffice it to say that not a single theologian has ever taught the laity, or individual priest, are permitted render such a judgment or make such public declarations on their own authority. Before a person can conclude that a Pope has lost his office for heresy, it requires an antecedent (prior) judgment that he has, in fact, fallen into heresy. The antecedent judgment must be rendered by the Church before the consequent judgment can be declared. And if the antecedent judgment is forbidden, as Kramer now argues ("a Pope cannot be judged, even for heresy") how could the consequent judgment (that he lost his office for heresy) ever be determined? If the Church was not permitted to render a judgment of heresy concerning a pope, it would be equally forbidden to declare that a Pope had lost his office for heresy. This explains an why the famous axiom "the first see is judged by no one" has been understood to include the exception "unless he is accused of heresy." But only the Church possesses the authority to render such a judgment and make any consequent declarations. All of these errors Kramer is spreading have been addressed and refuted in our book – a book, mind you, that Kramer has not even read and refuses to read. While it would take an entire book to refute all of Kramer’s lies and misrepresentations (the same tactic successfully used by the devil to have Christ put to death), we will briefly address just one, which is a perfect example of the modus operandi of Fr. Paul Leonard Kramer and his slander campaign. We will begin by quoting Fr. Kramer, who chose to comment on a mere two sentences we wrote in a recent article. We will then cite the previous paragraph, as well as the remainder of the paragraph from which the two sentences were taken, in order prove that Kramer completely misrepresented our position. We will then quote several pages from True or False Pope? in which we address this same issue. 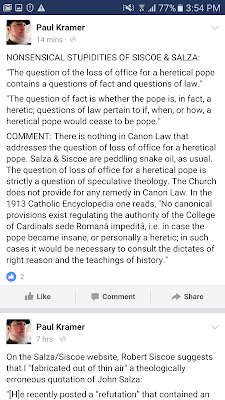 In the following Facebook post, Kramer refers to the “NONSENSICAL STUPIDITIES OF SISCOE & SALZA” (in all caps) for allegedly holding that the question of how the Church would deal with an heretical Pope has already been resolved. Now, it is obvious that in the two sentences Kramer quoted, we were simply stating the the loss of papal office for heresy concerns “questions of fact” and “questions of law”. Nowhere in those two sentences, or anywhere else, do we say the "questions of law" have been settled. If Kramer would have paid closer attention to what he was reading, he would have realized that our underscoring the lack of definitive guidance on the deposition of a heretical Pope was the very point we were making in the paragraph (and the previous one). The reason we were spotlighting this point is because it completely destroys the dogmatic Sedevacantist position. The reason it does so is because, since the Church has not settled the “questions of law” (i.e. if, when or how a heretical Pope would lose his office), no one can treat the opinion of any theologian as being the definitive teaching of the Church, and then use the theological opinion as a certain premise to draw a certain conclusion. The fact that this is the point we were making in the two sentences Kramer cited is clear from what we wrote in the previous paragraph, and even from the remainder of the paragraph from which the two sentences were taken (which Kramer conveniently failed to cite). “4) When we address a point that is disputed by theologians, such as if, when, or how a pope loses his office for heresy, we purposefully avoid taking a definitive position of our own, since 1) only the Church can settle such “questions of law,” and 2) the Church has never done so. Therefore, when it comes to if, when, or how a heretical pope loses his office, we do not take present the teaching of any theologian as being definitive and settling the matter. What we do show, however, is that none of the theologians support the Sedevacantist position, which is one of private judgment determining who is and who is not a true pope, without reference to the public judgment of the Church. What we see is that Kramer cited a mere two sentences and then accused us of “peddling snake oil” for allegedly saying the exact opposite of what we were arguing. This is just one example of the constant stream of lies, misrepresentations and strawman arguments being spread across the internet by Paul Leonard Kramer. Question of Fact – Is the Pope a manifest heretic? Sedevacantists cannot even get to first base with their “question of fact” approach until they resolve these “questions of law,” and yet resolving these complex questions are not within their power (not even the Magisterium has chosen to settle these questions). 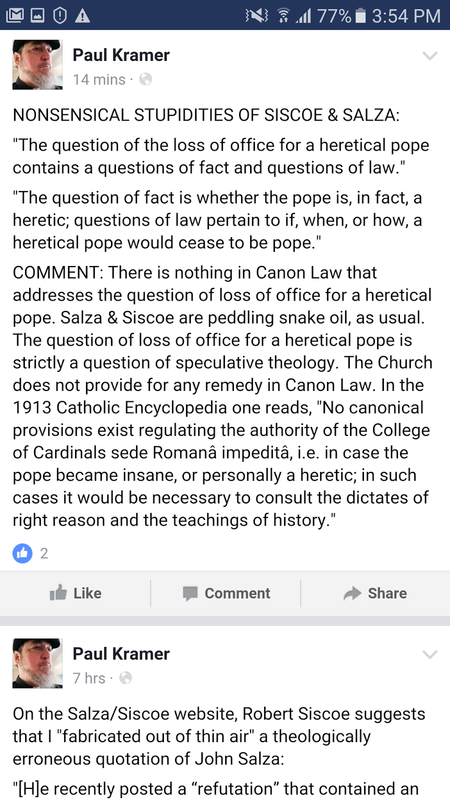 The entire Sedevacantist case, as it relates to “law,” rests upon nothing more than their own private interpretation of the opinions of certain theologians (especially that of Bellarmine, whom Sedevacantists have failed to understand), and which in no way constitutes the official teaching of the Church. ‘The present situation in the Church has generated many unprecedented problems of a theological and practical nature — for example the question of the in se [in itself] validity or invalidity of the New Mass… The Society must not presume to settle such speculative questions in an authoritative and definitive fashion, since it has absolutely no authority to do so. Any attempt by the Society to teach and impose its conclusions on matters of speculative theology as the only positions suitable for a Catholic to embrace is dangerous and opens the door to great evils, for it assumes a magisterial authority which belongs not to it but to the Church alone. As we have seen, even if the question of fact (i.e., is the Pope a public and notorious heretic?) was established by the proper authorities, the question of law (exactly when and how does the Pope lose his office) remains unresolved. It is clear that the unresolved question of law, in and of itself, completely negates the Sedevacantist position, without even addressing the question of fact, which is likewise something Sedevacantists have no authority to judge. As the reader can see, nowhere do we claim that the “questions of law” have been settled by the Church, as Kramer would have his readers believe. On the contrary, we explicitly state the exact opposite, and we do so over and over again. What is clear that Fr. Kramer is not interested in the truth, but only in slandering us in any way possible. He adamantly refuses to read the book (not that it would do any good, since he also misrepresented our position by citing two sentences from an article and then “interprets” them as meaning the exact opposite of what we said in the previous paragraph), but consistently accuses us of holding positions that we not only do not hold. Fr. Kramer’s dishonest tactic of “hit-and-run” Facebook posts may be sufficient to deceive, or confuse, some already confused Catholics who are understandably scandalized by the situation in the Church, but they won’t deceive those who actually read our book and articles.